Mid-stream transshipment faces the challenge of maintaining the most efficient and continuous transfer of material in open sea, which has been tackled variously in several of the existing systems. The Catamaran Transfer Vessel (CTV) represents the new generation of enhanced capacity transshipment vessels developed by Seabulk Systems Inc. of Canada. The transshipper is capable of handling bulk cargo or containers in open sea. 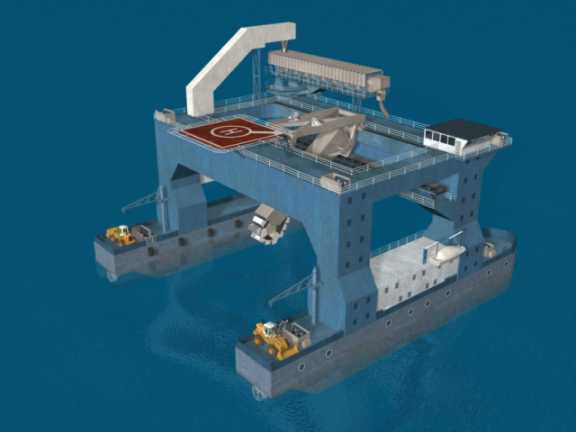 The unloading system is designed to transfer bulk materials from barges to ships at midstream at a rate of 3 000 tonnes per hour of coal (0.8 t/m3) or 4 000 tonnes per hour of ore (1.8 t/m3), based on a lump size of 100 mm (max) and moisture of 10% (max). The system for bulk cargo consists of a chain bucket reclaimer, built with ‘wear alloy’ steel, elevating material to a transfer conveyor and a C-loop conveyor that delivers the material to a fixed luffing/slewing/shuttling boom. The barges will be ranged between the CTV pontoons by four constant tension winches capable of open-sea reclaim. The system for handling containers consists of a trolley supporting a spreader, traversed by a 350 kW winch. The design rate for containers is 30 TEU containers per hour. With a total peak vessel demand estimated to be 1 600 kW, a 2 x 2 000 kW capacity generator set is required to service the peak load. One of the gensets will always be on standby mode, thus providing the vessel with 100 percent power backup. Power distribution will be divided into two: material handling and propulsion system. Each has its own MCC or Controller. In addition, an auxiliary system using a smaller genset and switchboard to service the marine "hotel" loads will be provided. The smaller genset will run independent of main generators during off/on-peak times. The generators will be controlled by a ‘power management system’ capable of automatic load balancing and paralleling of the gensets. General services and lighting distribution power will be through a step-down transformer. A separate 10 kVA transformer will be used to service control equipment including PLC processors, sensors and variable control drives. Transshippers are becoming critical to countries that have inadequate deep-sea ports. 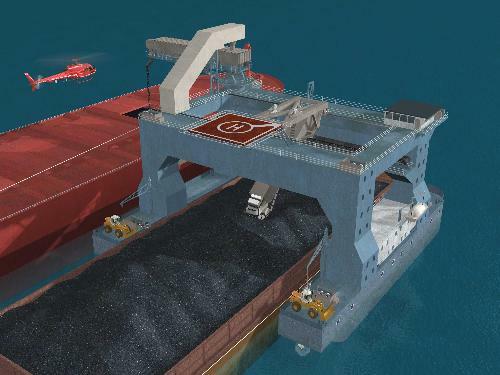 In the bulk trade, shipping of iron ore and coal is likely to be dominated by Cape size vessels and the CTV is designed to assist exporting countries with an efficient barge-to-ship transfer of bulk cargo. The flexibility of the CTV to handle containers provides an enhanced capability and thus improves utilization of the transshipper.